Thursday was my final day of working through the top floor of the West Wing of Kilmainham Gaol. However, this does not mean that it will be the last time that I work on the floor. I think its important for reflexive, ‘interpretative’ fieldwork that there remains the potential to revisit as I experience new locations in the prison, locate new types of graffiti and the objectives of the project refine. This is a decision that i have come to due to my experiences so far. In the few short weeks that I have been working exclusively on the top floor I have already had to reevaluate what is worth recording and why. Of course, alot of these choices are subjective and can be dependent on mood, timing, the quantities of graffiti already located in the room even the location of the ‘graffiti’ – if ‘the graffiti’ is located at the bottom of the wall, where there is noticeably less graffiti, there is a keenness to record it but equally there are more scratches due to more frequent interactions with the wall at this point. Is a scratch on the wall deliberate or accidental? Decisions have to be made! Is there anything under the accumulations on the wall? Although hidden to the naked eye will graffiti be revealed under accumulations on the wall in flash photography (this has been productive at least once!)? Should I survey the cells with or without lighting? What time of the day is it (important both for lighting and energy levels!)? The first two days I was recording in the prison I did not have access to an electricity source so I used my eyes to locate graffiti and photograph it. At times I noticed the intrusion (inclusion?) of previously unseen graffiti in photographs because that just happened to be located close to the graffiti that I did see. The above picture is a perfect illustration of this. I noted the text on the wall immediately on entering the room but as it was located in the relative shade of the wall close to the window I did not notice the fainter male portrait partially covered by it. Indeed, I did not notice the female portrait, which is almost completely covered by text, until I downloaded the image onto my computer. I expect the person who wrote the text did not see either portrait either! However, some choices about what we record are not simply related to whether we see the remnant of past interactions with the walls but whether we think they are worthwhile recording. Two frequent remnants that are not quite graffiti but are definitely manmade have been inconsistently recorded so far – these are rectangular ‘frames’ either created from attaching paper onto the wall (and the adhesive used taking plaster with it on removal / disintegration) or faint remnants of painted ‘picture frames’ (sometimes including trompe l’oeil ‘string’ and ‘nail’ emanating from them). These elements are so frequent in number and often merely hint at what was once there rather than revealing the subject of the graffiti that I have felt impelled to record the more obvious examples but at times have bypassed others. Should I be reconsidering this decision? i have also been considering how to deal with the ‘great whitewash’ of 1920. It has been stated elsewhere in this blogsite that the walls of the west wing were last painted in 1920 and therefore – in theory – that graffiti that remains has a definite terminus post quem for this year. 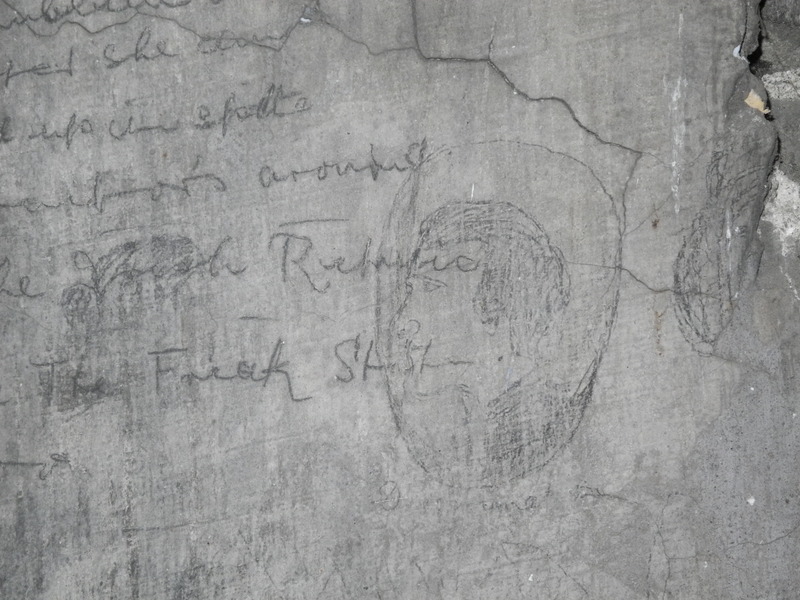 However the inconsistencies of the whitewashing (at times vast accumulations point to a piece of graffiti that was covered – either because of its nature of the thoroughness of the person doing the covering!) or conversely the revealing of graffiti through either poor original coverage, missed examples and/or the impacts of water seepage since that time have (inconsistently) revealed previous graffiti. At times it is relatively simple to ascertain that the graffiti is pre or post the whitewashing (often due to dating so often part of the graffiti, very faint outlines, partial revelation or you can actually see the whitewashing progress across the walls) but at other times it is not so easy to determine. This is particularly the case when large swathes of the wall appear to be have been ‘revealed’ or the whitewash was applied in a particularly lighthanded or sporadic way. But as with every reflexive methodology this may change as the project progresses, advice is received and new graffiti types are located elsewhere. This entry was tagged #graffiti #kilmainham #kilmainhamgaol #prisongraffiti #graffitimethodology #historicalgraffiti. Bookmark the permalink.